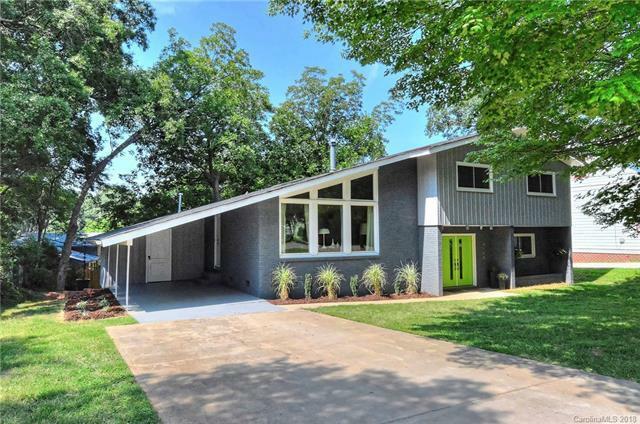 Extraordinary, move in ready, mid-century modern in Cotswold! This inviting, open floor plan offers so much vintage charm with plenty of up-to-date finishes! Main level features stunning, vaulted ceilings accented by wood beams, distinctive lighting, and gorgeous, refinished hardwoods. Spacious kitchen has 42" white cabinets, quartz countertops, stainless steel appliances, and island with large, undermount sink. New windows (2016) provide an abundance of natural light throughout. Guest bathroom features mid-century vanity and subway tile. Master bedroom offers walk-in closet and beautiful en suite bathroom featuring roomy, stone accented shower. Lower level boasts modern, industrial accents with eye-catching stained concrete flooring throughout den, foyer, and laundry/office area. Secluded, ambient backyard is complete with patio, privacy fence, and lush landscaping. New roof and water heater (2015). Minutes to Cotswold shopping & Plaza Midwood and a short drive to Uptown & SouthPark!